Mother of a LTTE martyr lights the flame of sacrifice to the portrait of second LT Malathi in Trincomalee. The mother of martyr Sankiliyan lit the common flame of sacrifice and the mother of another martyr Dominic Michael lit the flame of sacrifice for second Lt. Malathi. 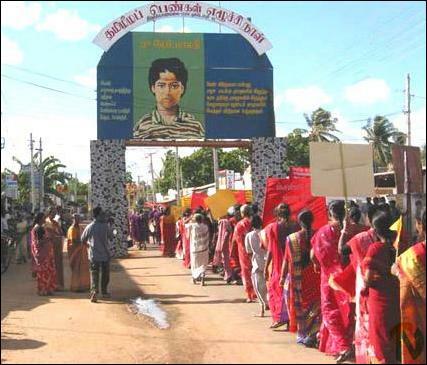 MsYarlisai in her speech said second Lt. Malathi died fighting the Indian army at Kaithady in Jaffna on 10th October, 1987 fifteen years ago with four other women and two men fighters. Since then the day is being observed as the Thamileelam Women Upsurge day, she said. Second Lt Malathi not only fought for the liberation of the motherland but also for the freedom of women. Women should work for the development of their society, Yarlisai added. Several others also spoke.